Wenglor 2D/3D sensors from Treotham have experienced a strong growth: The new performance class for weCat3D profile sensors MLSL2 includes a total of ten innovative models. As a result of this expansion, the sensors provide even more options for three-dimensional object measurement. In particular they permit large visual field widths of up to 1350 mm in the X direction, as well as increased laser power and even more extensive and faster profile detection. Whereas MLSL series sensors have thus far only been capable of covering visual field widths of up to 280 mm in the X direction, the ten new models offer visual field widths of up to 1350 mm in the X direction. This means that significantly larger objects can now be detected than in the past. 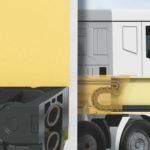 Diverse applications such as bin picking, pick and place, gap measurement, object counting and 3D sealant bead monitoring represent only a small portion of the possible uses for this technology. With dimensions of just 200 x 67 x 38 mm, the ten new models represent a successful mixture of performance and compact design. Variants with different laser classes including 2M, 3R and 3B and red or blue light also provide customers with maximum diversity for product selection. 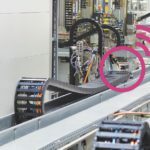 The high speeds and accuracy offered by the sensors result from their functional principle: The 2D/3D sensors project a laser line onto the object to be measured and then record it by means of an integrated camera. Two and three-dimensional surface and volume profiles can thus be calculated with the help of point clouds – quickly and accurately. With a total of 81 different variants in the weCat3D series, the 3D experts at Treotham offer greatest possible diversity for the implementation of multi-dimensional applications.